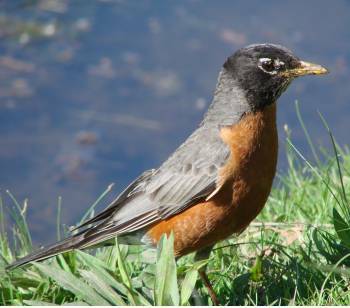 I saw my first robin this spring on my way to church this morning and smiled. Seeing that red-breasted bird after months of dreary bleakness always brings me hope. The little guy was sitting in a patch of brown muddy grass next to a stop sign – prime worming ground I’m guessing. Unfortunately for him and me tomorrow freezing rain and snow are in the forecast with the official start of spring only days away. Last year at this time we had unseasonable 80-degree weather. It doesn’t look like even the luck of the Irish is going to bring that warm sunshine this March. Sigh. Yet with the tweet of that “rocking” robin I am reminded that in the coming weeks the trees will bud and the daffodils and tulips will bloom. And while I wait for the warm weather to spring me (get it spring?) from my bulky winter coat and sweaters, I’m taking the time to declutter and purge the things crowding out light and energy from my life. Yes, in research for my next novel, I’ve been reading a lot about Feng Shui. In particular, I just finished a book by Cathleen McCandless called “Feng Shui that Makes Sense – Easy Ways to Create a Home that FEELS as Good as it Looks.” The principles and ideas behind this art and science of arranging and making a living space a place where you want to spend time and actually enjoy fascinates me. The concepts make so much sense to me. Step one in the form process is to get rid of anything you don’t love or doesn’t provide a practical use. So I’m slowly going room by room to get rid of the CDs, DVDs, VHS tapes, cassettes, old clothes, shoes, toys, books, knickknacks and other stuff taking up space in our house. After three trips to Good Will in the last few weeks, I’ve gotten rid of bags and boxes full of stuff and it feels great! In fact it feels better than great, it feels wonderful. I know I have a long way to go, but I will get there bit by bit, bag by bag, box by box. The best part is that my girls are getting into it too. They spent yesterday with me going through drawers thumb up-ing and down-ing clothes and toys. I am proud of their eagerness to make our house more of a home. Yes an “A-ha” moment from her kindergarten class’ life guiding principles. Yes, indeed…clutter does cause confusion. And so here’s to a clutter-free life filled with clarity and understanding. What about you? Have you heard of or tried feng shui? Any tips or suggestions?